Idomeneo is an opera seria with music by Wolfgang Amadeus Mozart. The libretto (words) are in Italian and were written by Giambattista Varesco. He based it on a French text by Antoine Danchet. In 1780 Mozart and Varesco were asked by the Elector of Bavaria to write an opera for a court carnival. Idomeneo was first performed in Munich on 29 January 1781. Mozart was only 24 years old. It was the first of his great operas. Mozart wrote three different types of opera: Idomeneo is an opera seria (serious opera). These were written in Italian, and are about serious, dramatic stories, often stories from Ancient Greece or Rome. La Clemenza di Tito is also an opera seria. Don Giovanni is an example of a mixture of comic and serious opera, while The Magic Flute is a German opera in the Singspiel tradition. Idomeneo has traditional recitatives and arias. The choruses, marches, and ballets were very much like French opera tradition. 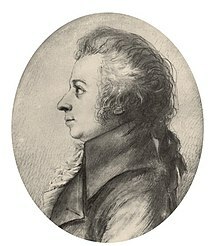 Mozart was inspired by the operas of Gluck. The story, based on an Ancient Greek story, takes place on the Island of Crete, shortly after the Trojan War. Ilia is the daughter of the Trojan King Priam who has lost the war. Ilia has been taken to Crete. She loves Prince Idamante, son of Idomeneo, but does not want to tell him about her love for him. Idamante is kind and frees the Trojan prisoners. He tells Ilia that it is not his fault that their fathers were enemies. The Trojans and Cretans (people from Crete) both welcome the return of peace, but Electra, daughter of the Greek King Agamemnon is jealous of Ilia. She is annoyed that Idamante had been kind and let the prisoners free. Arbace, the king's trusted friend, brings news that Idomeneo has been drowned at sea while returning to Crete from Troy. Electra, worried that Ilia, a Trojan, soon will be Queen of Crete, feels the furies of Hades tormenting her. Idomeneo is not lost at sea, but instead is saved by Neptune (god of the sea) and is washed up on a Cretan beach. There he remembers the promise he made to Neptune: he had promised to sacrifice (kill for the Gods) the first creature he should meet, whether it be a human or an animal. The first person he meets is his own son, Idamante. Because the two have not seen each other for a long time, they do not recognize one another at first. When Idomeneo finally realizes it is his own son he must kill, he tells Idamante to go away and never see him again. Idamante does not understand why his father is saying this. He is terribly upset, but runs off. The Cretan soldiers get off Idomeneo's ship and are met by their wives, and all praise Neptune. At the king's palace, Idomeneo asks Arbace what he should do, because he has disobeyed the god. Arbace says that Neptune would be happy if another victim could be sacrificed so long as Idamante is sent into exile (to another country). Idomeneo tells his son to take Electra to her home, Argos. Idomeneo's kind words to Ilia make her say very kindly that, because she has lost everything, he will be her father and Crete will be her country. As she leaves, Idomeneo realizes that sending Idamante into exile has made Ilia unhappy. Electra is happy about going to Argos with Idamante. At the port of Sidon, Idomeneo says goodbye to his son and tells him to rule like a good king. Before the ship can sail, however, a storm breaks out, and a sea serpent appears. It is a messenger from Neptune, who is angry with Idomeneo. Idomeneo offers his life to the god. In the royal garden, Ilia asks the gentle winds to carry her love to Idamante. Idamante says he must go to fight the serpent. When he says he would like to die because Ilia does not love him. This makes Ilia tell him that she loves him. They are surprised by Electra and Idomeneo. When Idamante asks his father why he sends him away, Idomeneo cannot tell him the truth. Ilia asks Electra for some kindness, but Elektra is madly jealous of Ilia now, and she wants revenge. Arbace comes with news that the people, led by the High Priest of Neptune, are shouting that they want Idomeneo. The High Priest tells the king that Neptune's monster is destroying things, and asks Idomeneo to say the name of the person whose sacrifice is demanded by the god. When the king says that his own son is the victim, the people are horrified. Outside the temple, the king and High Priest join with Neptune's priests to pray that the god will be kind and merciful. Arbace brings news that Idamante has killed the monster. Idomeneo is now worried that Neptune will want even more revenge. Idamante enters in sacrificial robes, saying he understands his father's terrible worries and he is ready to die., Idomeneo says a tragic goodbye to his own son and is about to kill him, when Ilia steps forward and offers to die instead. Neptune now changes his mind. We hear his voice saying that if Idomeneo gives up being king and lets Idamante and Ilia rule as king and queen, he will forgive. Everyone is happy except Electra, who wants to die. Idomeneo says that Idamante and his bride are the new rulers. The people call upon the god of love and marriage to bless the royal pair and bring peace. This page was last changed on 28 August 2018, at 00:00.